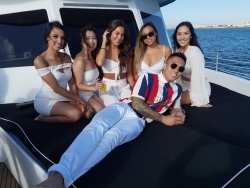 Zolna Yachts, San Diego's premier private yacht charter company, announces the first ever, pay per ticket Taco Tuesdays aboard the luxury motor yacht, "Nerissa." San Diego, CA, March 07, 2019 --(PR.com)-- Taco Tuesdays gained popularity in the 1980's, resulting in a Southern California and beyond tradition of going out for weekly tacos and margaritas at a killer location. Zolna Yachts has taken Taco Tuesday to the next level, offering their newest and most amazing 49 passenger motor yacht, Nerissa, for Taco Tuesday. And if that's not exciting enough, they are for the first time ever offering per ticket sales, priced at an incredible $99 per person. Passengers will enjoy all the amenities of this luxury yacht including a full bar, a hosted taco station, blue toothed music throughout, professional staff with a captain, two crew and a bartender, even pack your swimsuit and indulge yourself with a dip in the upper deck's steaming hot tub. Co-owner of Zolna Yachts, Shari Zolna said, "Not everyone has a large enough group or the funds to charter the entire yacht on their own. They end up on a tin can floating dining room just to have the opportunity to get out on the magnificent San Diego Bay for an affordable price. We are thrilled to open up this stunning yacht on Tuesdays for couples, singles and smaller groups at such an affordable price."